I can hardly believe it, Halloween is just around the corner. There's a chill in the air, the leaves are gracefully falling to the ground, and pumpkin spice everything has taken over the universe once more. I love Halloween. Now, I'm not much for parties or anything like that. I just like to stay home, hand out candy to costume donning children, and watch my many Simpsons Treehouse of Horror DVDs. My favorite thing about Halloween, however, is making my yearly Halloween Jack-O-Lantern! 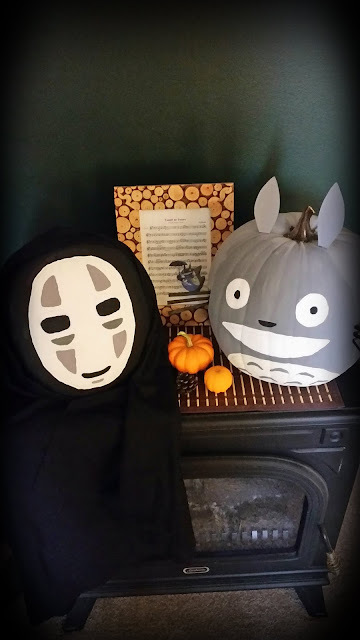 This year, I was fortunate to have a good friend come over to my house to paint pumpkins with me! 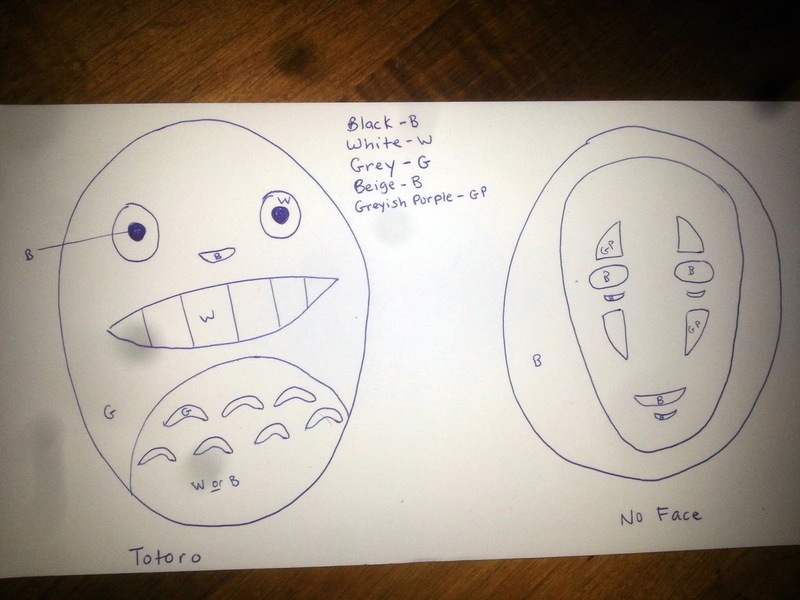 We decided to pay homage to a couple of amazing Studio Ghibli characters, Totoro and No-Face. Usually, I carve my pumpkins, but I thought that painting would be an awesome way to prolong the lifespan of our finished projects. 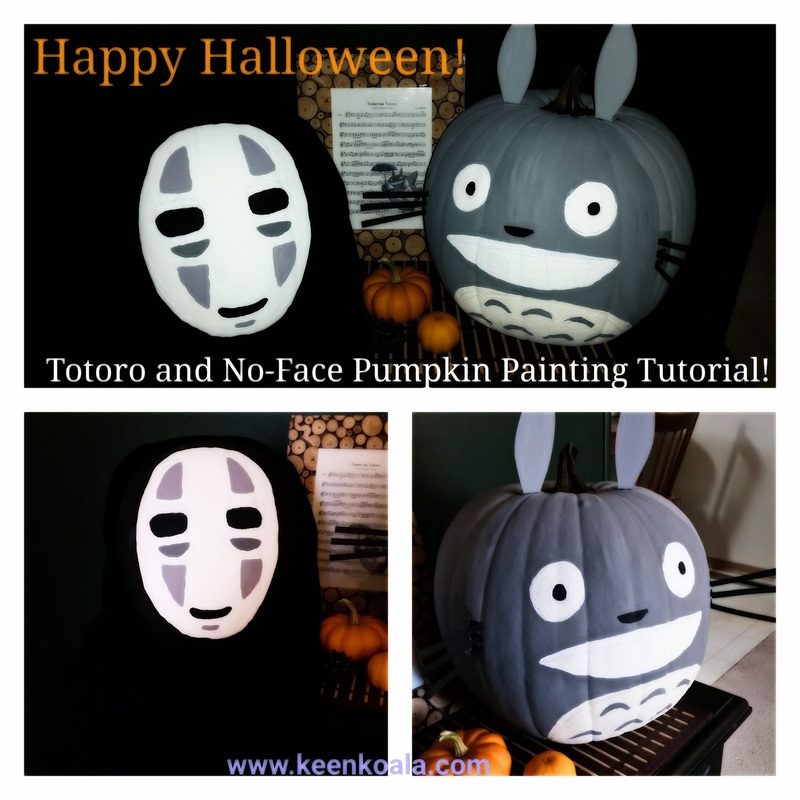 So, without further adieu, here is what you will need to paint your own Totoro or No-Face pumpkin! 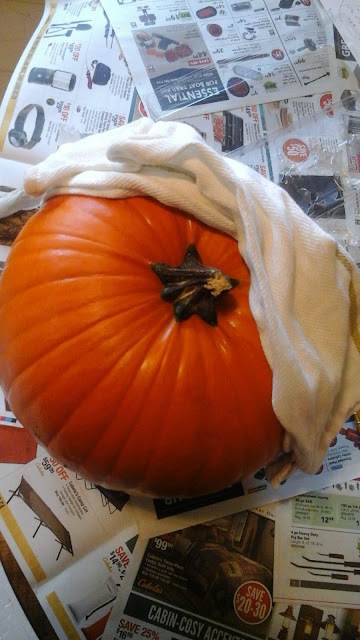 Wash and dry your pumpkin so that it is free of dirt and debris. Layer your work area with newspaper. 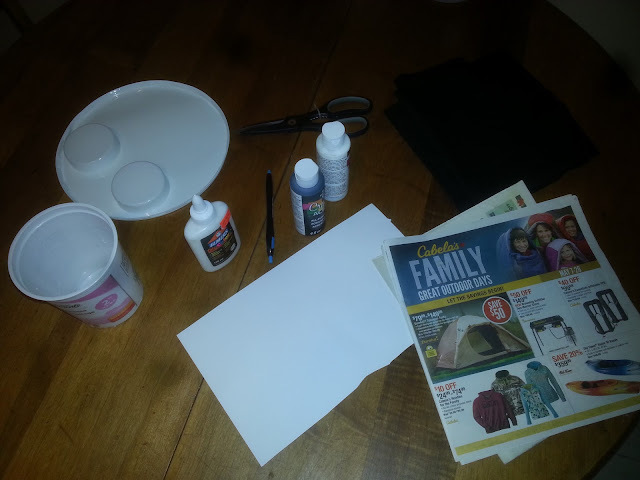 Set out your paints, paint brushes, mixing tray, and water cup. Make sure that you are wearing the proper clothing as painting can get messy. If you spill paint on your clothes, make sure to wash the spot immediately to avoid staining. Using a light colored pen or marker, copy the image below of your choice onto your pumpkin. I wouldn't suggest using a blue or black pen, as they will likely show through the paint. 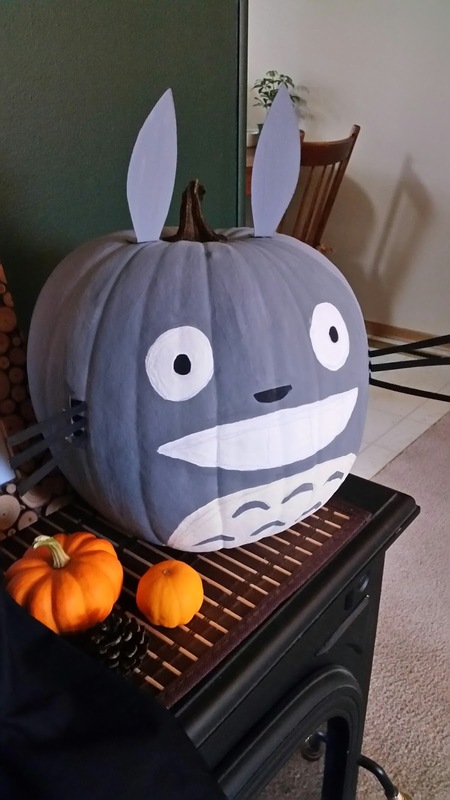 Once you have finished drawing the image onto your pumpkin. It is time to begin painting. Please see the diagram that you used during to drawing step to determine which area should be painted which color. Of course, you can paint your pumpkin any colors or shades that you like! Once you have completed the first layer of paint, it is likely that you will see streaks or orange peeking through the paint. This is easily remedied by applying a second layer of paint once the first coat is completely dry. We used a portable fan to help our paint dry quicker. Once your two layers of paint are completely dry, it's time to add the finishing touches. 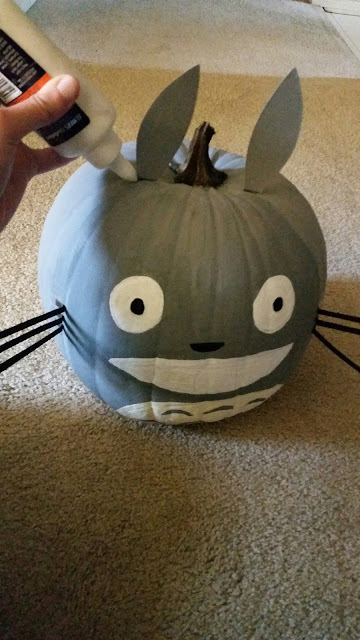 If you are making a Totoro pumpkin, you will need to create some ears and whiskers for him. 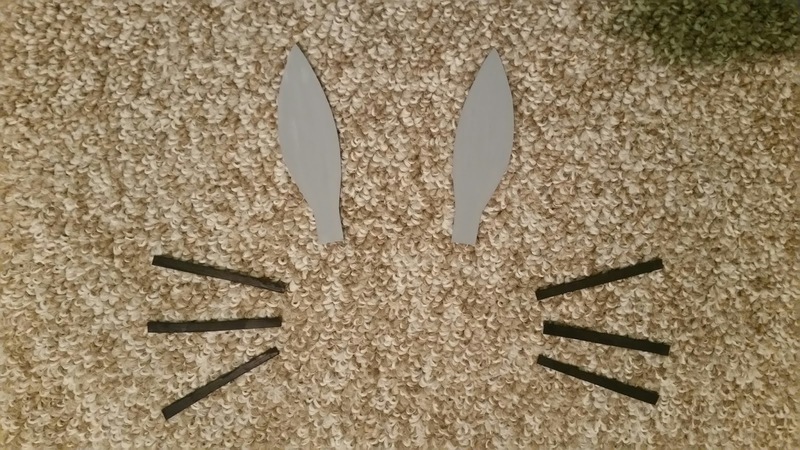 I have provided an image of my ears and whiskers below, copy similar images onto your cardstock, and cut them out. 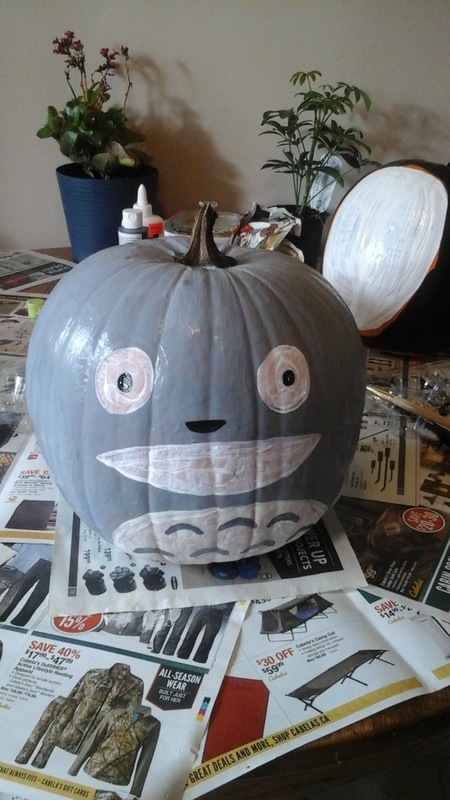 Paint the ears the same gray color that you painted your Totoro pumpkin and paint the whiskers black. You can now carefully glue or tape on your ears and whiskers. Now your Totoro pumpkin is complete! 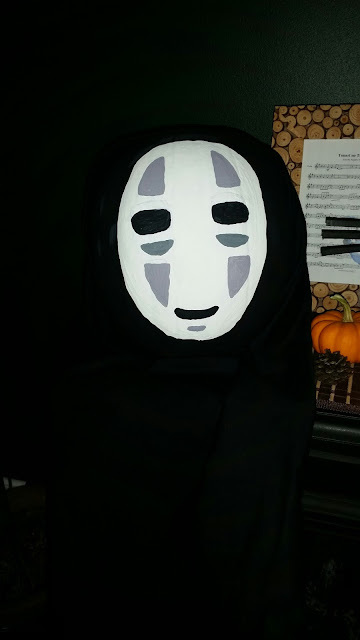 If you created a No-Face pumpkin, you can carefully drape the black fabric over him to create No-Face's signature black cloak. Gently tuck the fabric under his chin so that it will stay in place. Now, it's time to display your beautiful work! 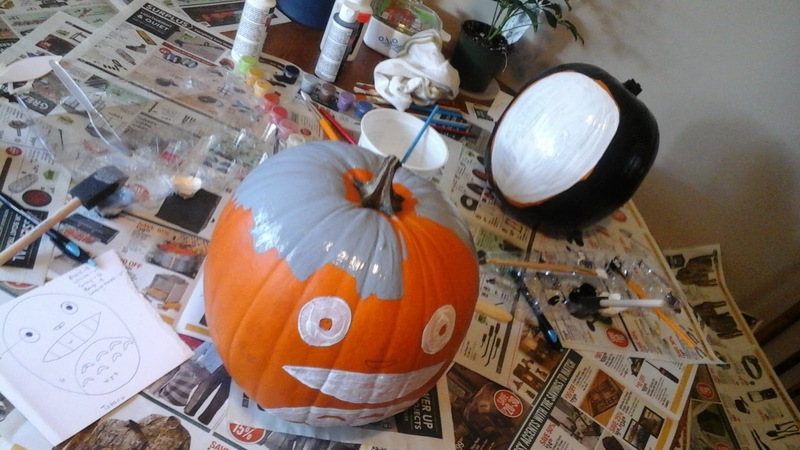 Make sure to display your pumpkin in a cool, dry place, as acrylic craft paint may wash away if exposed to rain. I hope you enjoyed this tutorial. Did you paint a pumpkin this year? Let me know in the comments section below, I would love to hear from you! Don't forget to 'Like' Keen Koala on Facebook for instant access to the latest posts, exclusive content, and contests by clicking HERE! Happy Halloween Everyone! Have fun and stay safe!